Users who do intensive work such as computer-aided design or Web authoring will probably like IBM Corp.'s new flat-screen portrait monitor. The rectangular screen is less restricting than a standard flat-panel or CRT monitor. The horizontal orientation makes it easier to think about what you're doing. 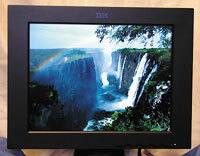 The 15-pound, 15-inch IBM T56 flat-screen monitor is one of the lightest and most space-efficient I have reviewed. It hovers about five inches above the stand when the 16- by 12- by 10-inch display is positioned horizontally. The T56 cannot exceed 1,024- by 768-pixel resolution at 87 hertz; any higher resolution and the screen blanks out before showing a warning message. The tiltable IBM T56 display can turn 90 degrees from its horizontal orientation. Clear graphics and sharp text were easy on the eyes and a pleasure to behold. A polarized filter effectively reduces glare by redirecting it to your lap. I have windows behind the screen in my office, and I never saw glare even on sunny days. The T56 is designed to meet international emission, power management and electrical safety requirements, consuming less than 66 percent as much power as does a standard CRT. The quality of its graphics is above-average, and text quality is well above average'not fuzzy as on most thin-film-transistor flat screens. At 1,024-by-768 resolution, there's one physical dot for every virtual dot, so the monitor doesn't have to emulate text, and each line is sharp. Setting up the monitor and installing the software was quick and easy. Except for the device drivers, which come on a floppy disk, the only other software that must be loaded is the pivot software that activates rotation to turn the image horizontal or back to vertical. Several years ago, mercury switches on the backs of monitors initiated the tilt. On the backs of the old monitors were two pairs of segmented metal wires at either end of a tube containing mercury. When you rotated the screen, the mercury would connect the wires, completing the circuit. Mercury is a toxic liquid metal, use of which has been discontinued for environmental reasons. Now the pivoting is software-controlled, but there are still some problems. I could not get moving images such as Motion Picture Experts Group-compressed graphics to rotate when the T56's software was initiated. The resolution would go fuzzy. The pivot software, from Portrait Displays Inc. of Pleasanton, Calif., worked better with open windows that constantly move, such as MP3 or RealAudio windows. Small MPEGs or audio-video-interleaved files would conflict when the pivot software initiated. A couple of times the window not only did not pivot, but the images within an MPEG became distorted and fuzzy. Despite the pivot problems, the energy- and space-efficient T56 ordinarily showed clear text and graphics. Surfing the Web or writing on the vertical screen was easier on my eyes and made everything look refreshingly different.